Lungomare Croatia Opatija, Lovran .. The coastal promenade Lungomare is a synonym for Opatija, the beautiful Mediterranean lady with camellias whose aristocratic magnificence has perfectly blended with the scenery of lungomare. All of the most important sights of Opatija and the Opatija Riviera are situated along lungomare: St. Jacob's church, the beautiful secession villas and hotels, arbors, monuments, terraces, etc. nature and architecture have reconciled, producing the perfect harmony. Reaching the sea by numerous natural or built paths and staircases reared in the rocks, which usually hide a secret bench too, as well as returning through beautiful Opatija's parks and gardens full of various flowers and rich Mediterranean and exotic vegetation always represent an unforgettable experience. belief that the sense and power of the nature's beauty is to connect people and places through its benefits. 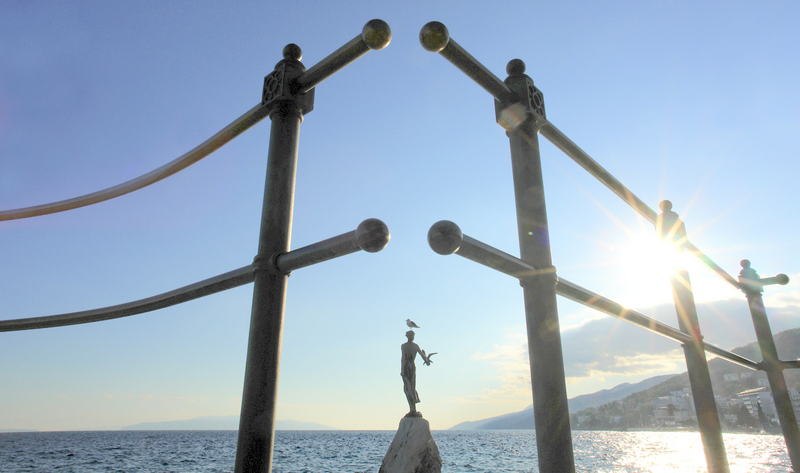 The aim of building lungomare was to connect Opatija, the queen of European cultural, recreational and wellness tourism, to the neighboring seaside places that also nourished the same values. Our lungomare souvenirs promote all the beauty and meaning of Opatija's famous promenade and embody its story which spreads from Volosko, through Opatija, Icici, Ika and Lovran to Moscenicka Draga. We have created them hoping they would always remind you of this special promenade story. Lungomare, Souvenir-Box: Secret of each box lies in its contents, but what makes a box special is its story…..
Lungomare, Souvenir-Box - content: natural soap, minerals, shells, pot-pourri ..